Technical Car Experts Answers everything you need: how to replace camshaft sensor on daewoo nubira? First remove breather box. 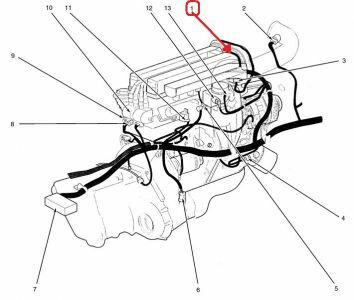 remove spark plug cover(top of engine two allen screws).see cam pos sen. wire clip at front of engine facing down, dont try to remove yet. clips are at the top sides of timing belt cover. from under the car remove plastic covers where you may find them on the pulley side and passenger side wheel well. using socket wrench relieve tension on torsion wheel(smallest pulley your s-belt crosses) by pushing up. release s-belt and remove(you may want to draw a quick diagram of how your belt is ran before removing). now remove the bolts from the timing belt cover. (when i did this i was also changing my harmonic balancer or crank pulley,if it is in the way of bolts remove the four bolts with a allen wrench,loosen it with the s-belt still on and car in fifth gear if standard to keep crank from turning. next place a long board or plank under the engine (across trans-housing,oil pan, as little on the oil pan as possible . place a jack at the center of the board and gently raise the engine. this relieves pressure from the top engine mount. remove the engine mount entirely. remove all screws from timing belt cover. remove cover. you will see two camshft gears at the top of the engine just below them you will see one star head screw(can usually be removed with an alle n wrench). it hold the cam pos sensor in place, remove then pull sensor out the top of the motor. sometimes they're a little bit stuck down in there. just pry a little but dont pull on wires! once removed disconnect wire replace, and rebuild. The sensor is on the front of the cylinder head . The Nubira is a car model introduced by the company Daewoo. The passenger car, for models produced between 1999 to 2002, experienced at least two recalls per model, including those for melting sensors and cracking hoses. Two recalls were published for the 1999 Daewoo Nubira. The two recalls were intended to replace camshaft position sensors that had the potential to melt and lead to the melting of their surrounding components. The 2000 Daewoo Nubira was also recalled twice for melting camshaft position sensors. A third recall states that the front brake hoses could develop cracks and eventually cause leakage and brake failure. The 2001 Daewoo Nubira experienced two recalls for melting camshaft position sensors, and one recall for front brake hose cracking. Similar to the 2000 and 2001 models, the 2002 Daewoo Nubira was recalled for melting camshaft position sensors on two separate occasions. The 2002 was also recalled for brake hose cracking in the front of the vehicle on one occasion. Labels: how to replace camshaft sensor on daewoo nubira.